When Debi Tapert, CEO of Healthcare Preparatory Institute, heard about the Emerging Leaders program launching in Las Vegas, she decided to go for it. When Debi Tapert, CEO of Healthcare Preparatory Institute, received an email about the U.S. Small Business Administration’s Emerging Leaders program launching in Las Vegas, she decided to go for it. The Emerging Leaders program, which seeks to give CEOs the tools to help grow their businesses, launched in April in Las Vegas and the 14 participants met bi-weekly for 26 weeks. Eligible small business participants must be a CEO, COO or CFO, have been in business for at least three years, employ at least one worker besides the business owner and generate between $400,000 and $10 million in annual gross revenues. Participants work with experienced mentors in fields such as accounting, finance and government contracting. The classes are taught over five modules in classroom-based sessions, which include live case presentations, in addition to meeting outside of class with their CEO mentoring groups. Tapert said that though each meeting was held in the same format, the content that was discussed changed every time. Tapert added that many of the modules such as human resources, finance and marketing, included a group of experts in the field who shared their knowledge with participants. “They were there to help us better understand how their particular field could help each of us grow,” she said. Michele Bedwell, CEO of Diversity Marketing, LLC, said she was in search of ways to develop public outreach for government projects for her firm, which oversees all aspects of print, broadcast media and communications campaigns. In order to graduate, participants had to complete a three-year Strategic Growth Action Plan and present it to a panel of experts. Ginnie Salazar, executive director of Logistical Solutions, a company that owns and operates heavy equipment, said putting together the action plan helped her plot the future of her business. Salazar said that managing her time and being open to new ideas were some of the biggest challenges she faced as an Emerging Leaders participant. 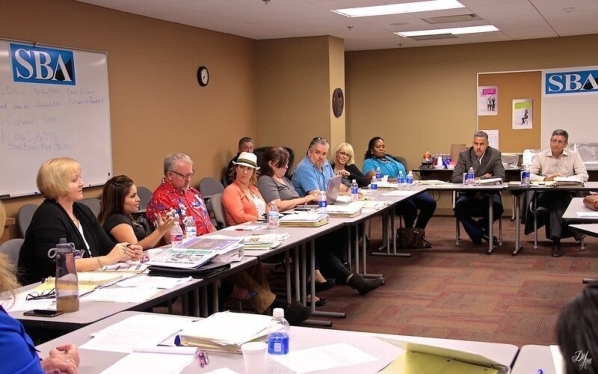 On Dec. 10, the 14 Emerging Leaders program participants will attend a graduation ceremony at North Las Vegas City Hall. “The graduation ceremony offers a platform to underscore the importance of investing in and sustaining quality programming for people who are willing to invest in themselves,” instructor Shelley Lynn said. She added that the course is designed to track the growth and outcomes of each Emerging Leaders participant over a three-year period through a survey and interview. Tapert said the Emerging Leaders program has benefited her business by making her a more confident and knowledgeable leader who has a new perspective on business and its future.